Figures released on their Official Site show that the Conference club have made a loss of £940.482 in the year ending 30th June 2008. The report goes on to say that the continued funding of management, new players and loan players will result in a similar loss during the season just ended. "Whilst we managed to recover from a disappointing first two months of the season, our attempts to gain a big pay-day via promotion, a play-off final or an FA trophy did not materialise." It is understood that the figures for the year ending 2008 included player wages of over £1.2m, management costs of nearly £350k and operational staff costs of over £500k. One of three new directors has been charged with the task of reducing losses to a manageable level and within two years to make the Club profitable. Accrington have been handed a massive boost in their fight against a winding up order after minor shareholder Ilyas Khan pledged to hand the club £250,000 if they arrange a new share issue in the club. The previously announced takeover of the club, agreed between majority owner Eric Whalley and club general manager Dave O'Neill, has collapsed. Chief Executive Rob Heys has confirmed to the press that their budgets will have to be cut further for next season, with the local press suggesting the original budget for next season was £10,000 a week. Shrewsbury striker Grant Holt is claimed to be a target of Norwich, while midfielder Ben Davies appears likely to leave on a free transfer in search of higher graded football. Leyton Orient chairman Barry Hearn wants clubs going into Administration to be demoted at least one division. In a rant in The People, he called them cheats and they are no better than drugs cheats in athletics. Notts County will receive a six figure cash boost after the Football League confirmed it will pay money owed by Southampton for two players directly from the TV money due to the Saints. One League Two side has agreed a £175,000 transfer fee for Peterboro striker Liam Hatch, according to Barry Fry, with Rotherham, Shrewsbury, and Lincoln all named by the press as likely candidates. Below is a list of the latest odds available for a club to win the League Two Title this coming season. Tony James had said that he is looking forward to playing at Edgar Street again. The former Hereford United defender recently signed an extension to his contract with newly promoted Burton Albion. He admits that he has always wanted to play in the League. "Playing in the league is something I’ve always thought I’m capable of doing and to finally get the opportunity is brilliant." James made over 250 appearances for the Bulls between 1998 and 2006 but wasn't offered a contract by Graham Turner when Hereford were promoted to League Two after winning the play-off final against Halifax. "Coming to Burton when Nigel was manager, I understood what his plans were when I signed. "The first season he wanted to get in the play-offs and the second season he said we might as well have a go and we did it. "I don’t think there’s too much difference between the lower half of League Two and the Conference. "The top 10 teams maybe have one or two stand-out players who arguably shouldn’t be playing at that level. "It’s a fresh challenge for everyone. It will all be new when we come back for pre-season training under the new manager. "I have always wanted to go back to play at Hereford. "I wish Hereford all the best and hope they have a good season, but on the days that we play them, I hope they have a bit of a stinker!" Stockport's Supporters' Trust has withdrawn from negotiations to buy the club. They had assembled a consortium with £1million in guaranteed funds, but baulked at the demand for a £200,000 non-returnable deposit to continue talks with a large number of unanswered questions about the club's financial predicament. Shrewsbury winger Chris Humphrey is attracting interest from Premier and Championship clubs, according to his agent. Ex-Bull Neil Mackenzie has signed for Tamworth following his release from Mansfield. The midfielder has been somewhat nomadic in the last two seasons, having brief stints with the Stags, Notts County, Kidderminster, and Port Vale. Failed bidders to develop the Edgar Street Grid, Modus, have gone into Administration. Commercial property values have slumped by over 25% in the past year, and experts expect other companies to follow. Southend are reported to have lodged a six-figure bid for former loanee Theo Robinson after he scored seven times in 21 games for the club. Watford have previously denied receiving a bid from Swindon for his services. Lincoln are set to lose the services of defender Lee Beevers after he rejected a new deal, with both Colchester and Motherwell interested. Darlington have signed defender Ben Starosta from Sheff Utd. The 22 year old never played for the Blades but had a series of loans over the last two years at the likes of Bradford and Aldershot. The taxman has issued winding up proceedings against Accrington over £300,000 in unpaid tax. The club face the court on June 10th for a similar amount to that owed by Bournemouth, who face court a month later. Stanley are blaming the debt on losing a third of their average gate since entering the Football League three seasons ago, the collapse of sponsors Fraser Eagle, and the cost of meeting FL rules on the amount of seats in their ground. They estimate the loss of the sponsor and the cost of the additional seating to be £160,000, while a club statement says average gates have dropped from 2,260 to 1,415 - a loss in revenue of around £200,000 over the course of a season. If they fail to raise the necessary money by the June 10th deadline they can ask the court for an adjournment if they can prove they have made sufficient progress. The likely course of action, barring the sale of star assets of which they have few, would be to enter Administration before the date - a course of action that would almost certainly see them docked 10 points for next season. Update: An Accrington statement says total debts are under £400,000 - meaning that the taxman, as majority creditor, would veto any potential CVA as is their usual intention should the club go into Administration. In other news Bournemouth have paid their players after Southampton paid them a chunk of money due over the transfer of youngster Matt Paterson after he made his tenth appearance for the Saints. The players had put in 14 days notice on the club after finding their wages short but, with the Saints paying their own wage bill after agreeing an exclusivity contract with a potential buyer, the immediate threat of a player walk-out appears to be averted. Meanwhile rumoured Bulls target Craig Hinton has joined Northampton on a one year contract. Darlington have another new owner with Raj Singh being declared as the man now in charge. Barely a week after former owner George Houghton was named by the Administrator as the winning bidder, after he apparently had scared off all other parties with his demands over the stadium and surrounding land, former vice chairman Singh has returned to the fold after apparently agreeing a deal at the third time of asking. Singh will own the club and stadium outright, and share ownership of the surrounding land with Houghton. Fans were vocally behind Singh from the outset with many blaming Houghton for the club's predicament and there was threats of a boycott if Houghton was the man to take charge. Hereford United have signed Darlington defender Ryan Valentine, pictured, on a one year contract according to the official site. Valentine is a 26 year old Welshman who was born in Wrexham. "He's a full back and can operate at both left back and right back. I am very happy to have signed him," said John Trewick, the Hereford United manager. Ryan Valentine (born 19 August 1982) is a footballer who plays for League Two side Darlington. He has also played for the Wales U21 team. He started his career as a trainee with Everton and was first signed by Darlington in July 2002 and moved to Wrexham on a free transfer in the summer of 2006. He was called up to the Wales national football team to face the Czech Republic and Brazil, but has yet to earn a cap. In the 2006/07 season he played a vital part in Wrexham's survival bid, as he scored the penalty in Wrexham's must win game on 5 May 2007 against Boston United which levelled the score at 1-1. Wrexham won the game 3-1 and stayed in the Football League. It was announced on 18 January 2008 that Ryan has left Wrexham and rejoined his former club Darlington. Last season he made 48 appearances for them. However current money problems at Darlington has led him to look for another club. Darlington have been cleared of breaking salary cap rules by the Football League despite spending 110% of turnover on wages rather than the allowed 60%. The FL say the rest was acceptable as it was an equity injection into the club. Lincoln will allow playmaker Stefan Oakes to leave the club as manager Peter Jackson believes his first team chances will be limited. Rotherham striker Richie Barker has retired at the age of 33 due to a knee injury. He is a fan favourite at Hartlepool and has been previously linked to a coaching role there. Port Vale's managerial post is down to Micky Adams or John Ward. Kidderminster have withdrawn from the Errea South West Challenge tournament in early July due to not believing they'll have a team in time. Chester owner Stephen Vaughan has effectively blocked the sale of the club to anyone else after telling the local press he would want the full £4million in debentures he holds in the club from any other bidder. He plans to retain control of the club and cut the club debts through a CVA to £290,000 by paying the remaining creditors 10% and wiping out his debentures. Merthyr Tydfil will not be taken over by Bridgend after owner Wyn Holloway upped the price by £75,000. A local consortium, led by hooligan writer Annis Abraham, now plans to take over the club and borrow younger players from Cardiff through Abraham's links with them. Bristol Rovers sold all 96 tickets for their shirt sponsorship draw, with a recruitment firm winning the home shirt sponsorships, and a solicitors winning the away shirt deal. The draw has earned the club close to six figures for the coming season. Wimbledon have unveiled plans to move back to the Merton area. They want to turn Wimbledon greyhound stadium, next door to the old Plough Lane, into a 6,000 capacity football stadium. Worcester will remain in Conf South next season after officials made the bizarre decision to put Gloucester into Conf North instead. Bristol Rovers defender Craig Hinton, whom the Bristol press have linked with Hereford United, has spent the week at Lilleshall in an effort to help speed his recovery from the problems which needed injections in both knees and cut short last season at the Memorial Stadium. The former Kidderminster Harriers player has also been linked with Cheltenham Town and Northampton Town. Meanwhile season ticket sales start at Edgar Street. With few players on the books no rush is expected. Finally Chris Weale, who scored against the Bulls whilst with Yeovil, has signed for Leicester City. Weale came to Edgar Street on loan last season but his spell with Hereford United was cut short when he damaged his hand and had to return to Bristol City. Dean Beckwith's agent is claiming the defender is wanted by a couple of League One sides. David - brother of Robbie - Threlfall has told the agent-friendly Sky Sports that his charge is in demand: "There have been a few tentative enquires from some clubs asking about Dean's situation. Dean has a wealth of experience having played more than 150 games for Hereford and he is ready for a new challenge in his career." Beckwith is not the first player for the elder Threlfall to collect as a client after his brother's loan at Edgar Street as Garry Breen left Edgar Street also a client. Hereford United use a company called Lindley Catering to provide food and refreshment at Edgar Street. And in today's Hereford Times the company is advertising for a part-time manager to manage their food kiosks at the ground. But in today's climate isn't it time to give the chance of these contracts to a local Hereford or Herefordshire based business? Every time a purchase is made from the kiosks the profit goes out of the area. The company is based at Stoke on Trent. Hereford United chairman Graham Turner wants as many local people to watch the Bulls. Supporting local business, whenever possible, by the club could help. Meanwhile in Scotland some football clubs have been accused of fleecing fans - by failing to make sure the VAT has been cut on the pies, Bovril and hotdogs sold at their grounds. Lindley Catering provide food services at several Scottish football grounds. "The escalation in food prices resulting from higher commodity prices has been well documented and publicised," they said in a statement. "Food costs at the time of the VAT change were increasing by an average of 11.5% and in order to manage some of these price increases, we took the decision to offset the 2.5% VAT reduction against these higher costs, which enabled us to provide stable pricing for the season." Finally a recent survey carried out by Lindley Catering shows that 92% of all football fans nationwide who responded said that their favourite stadium snack is a pie. Why not a 'Hereford' pie made in the county with Herefordshire ingredients? Firstly Steve Guinan who has signed for Northampton. "I wish Steve all the best," said Trewick. "Initially we did not reach agreeement but a bigger club has come in and he has decided to take their offer. "He had a good year for us but he is going on 34 and six months can be a long time at that age." And a comment on signing Kidderminster centre-back Keith Lowe. "He is a good character and has experience in the Championship with Wolves and Burnley. "I feel he can do a good job for us." Trewick has talked to former Bull Rob Purdie. "I would like to have brought Rob back but there was no chance when a club like Oldham came in," said Trewick. Another local pre-season friendly, this one against Pegasus, is expected to be announced shortly. Meanwhile the paper has a few quotes from Guinan. "Everyone knows that deep down I would like to have stayed but that’s football. The offer was not there so you have to move on to the next. "I certainly didn’t see a two-year contract coming and never in a million years thought that I would get that. "At my age, I would have been a fool not to take it - there was no point in waiting. I would not have got a better offer than that so now I can go on holiday and relax. "But a particular highlight was when Graham Turner made me captain last season. That was a great honour and I hope I was able to repay him with some good performances towards the end of the season." Cheltenham have agreed to sell 15 year old prospect Jamie Edge to Arsenal. He has been with the club for seven years. Ex-Bull Mel Pejic is claimed by the Crewe press to be interested in their senior physiotherapist post. He has been with Wrexham in a similar role after finishing playing in 1995. Chesterfield have received Football League approval for former Sheff Weds chief Dave Allen to put a £6million investment into the club. They needed approval as Allen is still owed £2.5million by the Owls, with £4million of the deal buying a majority stake in the club, and a £2million loan to help fund their new stadium. Bradford boss Stuart McCall believes striker Peter Thorne will quit football if he rejects his new contract at the club, saying he wouldn't like playing in front of smaller gates. Danny Davidson has been released by fellow ex-Bull Nicky Law at Alfreton. He spent the end of the season at Matlock. Shrewsbury are fighting Aldershot to sign released Brighton striker Jake Robinson. He scored four times in 19 matches for the Shots on loan over the last three months of the season. Hereford United have confirmed that season tickets have been received from the printers and will go on sale on Friday. Supporters are reminded that they can purchase their tickets through a finance scheme. Former Hereford United manager Graham Turner has received a special award for his services to football by the LMA (League Manager's Association). The dinner was held last night in Nottingham and Turner picked up a glass trophy. He was also recognised, alongside Steve Coppell, as having chalked up over 1,000 games as manager. Several sources are reporting that former Forest Green Rovers captain Darren Jones is in talks with Hereford United over a move to Edgar Street. "I have had some good times at Forest Green, but the time is right to move on and take up a new challenge," said Jones. 25 year old Jones, pictured, is a central defender who has played over 100 games for Forest Green. His FGR profile says: Noted for his strong, hard tackling and powerful free kicks, Darren is a pillar of strength in the Rovers defence. A Welsh Non League international. Meanwhile the Stockport Express are reporting that the Bulls are also tracking Michael Rose. He has already had talks with Swindon and Morecambe with Hartlepool also interested. Macclesfield have signed striker Kyle Wilson on a one year deal. The 23 year old scored 24 times in 32 games for FC United of Manchester last season before injury ended his season in January. Notts County have confirmed they have made an offer to released Ipswich striker Billy Clarke. The 21 year old has a string of clubs chasing him after 16 League goals in 33 games for three loan sides last season. Millwall have released ten after their play-off failure. Those on their way out include Welsh defender Richard Duffy and right midfielder Adrian Forbes. Morecambe appear to have backed out of the chase for ex-Bull Michael Rose, saying they wouldn't agree to his wage demands. Ex-Bull Phil Robinson is named in the local press as a front runner for the no.2 job at Crewe. Lincoln have signed midfielder Richard Butcher on a two year deal. The 28 year old was released by Notts County after two seasons and joins the Imps for the third time. Dagenham have given 39 year old keeper Tony Roberts a new one year deal. Bournemouth owner Paul Baker has confirmed a new bid for the club, and he expects a second bid shortly from one of the other six interested parties. "I would like to say a huge thank you to all the Hereford United fans who have supported me during my time at Edgar Street." "I've had a great time, met some wonderful people and the club has a place in my heart. It's a shame that we had to part ways like this but footballs a strange game at times with all of its up's and down's and as long the club does well than thats the most important thing." "Thanks once again and hopefully one day I’ll be back in some way or other." The Bulls have been dealt a blow after Steve Guinan agreed a two year contract to play for Northampton Town. Manager Stuart Gray told their official website: "I am sure Steve will score goals for us. He has a lot of experience and that is vital. I look at the successful sides, and in Championship play off final you see Burnley who have a number of experienced players with knowledge and know how and you see what an influence they have. "Steve is a student of the game who has his coaching qualifications and he is a very intelligent player who can pass on his knowledge to the younger lads. A few times last season we fell flat but he can be a leader and he can organise and he has won promotion from this level on more than one occasion so he knows what is required. He scored 15 goals last season in League One in a relegated side and he was their Player of the Year so he comes with a decent record. "We need plenty of talkers out on the field and Steve will be one of those." Guinan will officially become a Cobbler on July 1st on the expiry of his Bulls' contract. He leaves the Bulls after 64 goals in 175 games for the club across four seasons and a three month loan spell. The striker has given an interview to BBC Sport. "I've had a good time at Hereford and being honest it's a dissappointment with what's happened contract-wise. But that's football and you move on," said Guinan. "Hereford were always one of the favourites to get relegated but I scored quite a lot of goals in a team that did get relegated. "In my two last full seasons in League Two I have had two promotions with Cheltenham through the play-off final and with Hereford so I know what League Two is all about." Former Hereford United defender Michael Rose is set to sign for Swindon according to press reports. However the deal is not yet confirmed as Rose is said to be asking for a pay deal which Swindon might not be able to agree. Rose has one year left on his contract at Stockport but they are keen to cut costs as they are in administration. The 26 year old former Manchester United trainee was seen in Hereford last week but it isn't known whether he spoke to anyone at Edgar Street. The only firm offer on the table for Bournemouth has been withdrawn. Seven potential bidders have held talks over a sale, with five completing confidentiality agreements, but only one had made a bid. Chesterfield are claimed to be talking to Dean Windass over their managerial vacancy, according to the local press. Notts County have denied receiving an approach for assistant boss Dave Kevan from Crewe. Kevan worked with Crewe boss Gudjon Thordarson at Stoke, and are on the lookout for a new no.2. In other news Godwin Antwi, who had a short loan with Hereford United last season, has been linked to Accrington Stanley. The young Liverpool defender had a spell with Accrington two years ago. Meanwhile another former Hereford United player is on the move. Andy Moran, who has been a prolific striker at lower level, has signed for Prestatyn. Bournemouth are to seek PFA help to pay the wages for the second time this season with the taxman pushing for money it is owed. While the club paid off a winding up petition over a £10,000 debt the taxman added itself to the petition, before it was dismissed in court, for £300,000 it has been owed for some time. That petition was adjourned and will now be heard on July 13th, but the club faces the prospect of losing players if it cannot cover the wages. The players have received only 60% of April's wages, according to the Daily Echo, and the club has little prospect of paying May's wages, due at the end of this week, without the help of the PFA. They needed PFA help to cover wages in February, but have paid off that loan since. The paper reports that the wage bill, including PAYE due to the taxman, is up to £130,000 a month. Shrewsbury manager Paul Simpson has released former Bulls pair Moses Ashikodi and Nick Chadwick after their play-off final loss. They are amongst seven players to be announced to be released today. Winger Marc Pugh, who is out of contract at the Prostar Stadium, appears to have already departed with no mention of him in today's announcement and his name being removed from their squad list prior to the weekend. Between them Chadwick and Ashikodi provided three goals for the Shrews in 27 appearances, after the pair were released by the Bulls after just two goals in 19 games. They have offered new terms to six players including goalscoring midfielder Ben Davies and winger Chris Humphrey. Bulls high in "REAL FANS" list. Statistics recently released by The Football Forum's number crunchers place Hereford fans in third place in a table produced to illustrate the number of travelling fans expressed as a percentage of the average home support with a figure of 14.5%. Only Oldham (15.6%) and Northampton (14.6%) topped the Hereford away support. Whilst The Bulls almost understandably sit at the bottom of the average home attendance list, it does show that those who do attend are amongst the better supporters in the Football League. By comparison, of the MK Dons fans who attend home matches, only 6.7% bother to travel to away games leaving them bottom of the pile while Cheltenham Town carry a fairly poor 8.4% of their "massive" to opposition grounds. In League 2, Slopshire Town achieved a creditably mid-table position with 11.5% of the average home attendance witnessing their abysmal away form. Following the final determination of the make up of League Two for next season, half a dozen bookies are now offering odds. The Bulls range from 14/1, with two firms, to 25/1 with bet365 and are 11/2 for promotion. Shrewsbury are generally installed as favourites and as low as 15/2, with Bradford and Northampton both in single figures with most. Bury are a surprise favourite for William Hill at 8/1, but others go as far as 16/1. At the other end of the scale Macclesfield and Accrington are the two at the bottom of the list, with Stanley available at 66/1 and the Silkmen at 80/1. In the Conference the bookies expect Luton (10/3) and Oxford (4/1) to make it a two horse race. AFC Wimbledon are 20/1 for their first tilt at the fifth tier, with Kidderminster 25/1 and Forest Green 66/1. Chester are rated as a 33/1 shot. Scunthorpe are back in the Championship after beating Millwall 3-2 in a classic play-off final encounter at Wembley. Scunthorpe's Matt Sparrow gave them an early lead, the first of two goals for him, but a quickfire Gary Alexander double put the Lions ahead before Sparrow's second before a late Martyn Woolford goal sealed the win for the Iron. Darlington To Get New Points Penalty? Darlington appear to be ready to get another points penalty after a new company was set up. Darlington Football Club 2009 Ltd was, according to the Sunday Sun, registered on Tuesday. If this company is used to resurrect the football club then they will fall foul of League rules about exiting Administration. Luton, Bournemouth, and Rotherham all exited Administration with new companies and suffered considerable penalties last season. With it being Darlington's second Administration, they would be likely to follow the Cherries and Millers in being 'offered' a 17 point penalty in exchange for the transfer of the Football League 'golden share' to the new company. Such a penalty will almost certainly rule them out as promotion candidates, and the slashed budget could well force them further down the table. New manager Colin Todd will meet the players on Tuesday to see who is willing to stay, mostly on reduced terms, and who will follow the three players already departed. Every player will have to be paid their full outstanding wages under League rules regardless of which company emerges as Darlington FC. Scunthorpe's Ex Bull Gary Hooper has been declared fit for this afternoon's League 1 Play-Off Final at Wembley against Millwall. The striker who has 30 goals to his name so far this season has already put three passed Millwall in the normal season. The game, which kicks off at 1.00 pm can be seen on Sky Sports One is refereed by young Michael Oliver just 24 hours after his father officiated in the League 2 final. Gillingham beat Shrewsbury 1-0 in today's League Two play-off final to confirm next season's line-up. Simeon Jackson's goal was sufficient to seal a win that the Gills deserved after battering the Shrews defence. Ex-Bull Nick Chadwick started the game, with Moses Ashikodi a late substitute. Gillingham finished the season in fifth place, two places and six points ahead of Shrewsbury. In other news two ex-Bulls finished their Scottish Premier League campaigns today. Ryan Esson was relegated with Inverness on goal difference after they lost to Falkirk, while Trent McClenahan's Hamilton finished 9th out of the twelve. Both players played in around half their sides' matches this season. Merthyr Tyfil's bidders are Bridgend Town. The Welsh League side are cash rich after selling their home ground to a supermarket and plan to take Merthyr's Southern League place with the Martyrs returning to the Welsh pyramid for the first time since 1945. The Bridgend side are to play matches at Brewery Field next season, a 12,000 seat rugby ground in the town that they have purchased a stake in. Dagenham's out of contract duo Ben Strevens and Sam Saunders are wanted by Brentford. Former Bulls target Strevens scored 13 goals last season, with Saunders netting 14 from midfield. The Daggers have signed Stuart Thurgood on a two year contract. The midfielder left Gillingham in January and finished the season at Grays. Macclesfield chief executive Patrick Nelson is to quit the club to take up a similar role at the Irish Football Association. Port Vale have interviewed three people for their manager's job. John Ward, Micky Adams and an unnamed 'surprise contender' are the ones up for it. Crewe have dispensed with the services of assistant boss Neil Baker after 15 years, but he may be offered a scouting role with the club. Graham Turner wants John Trewick to get the spine of the team right as they do the usual financial juggling act to stay within the wage cap rules. Speaking to the official site he said: "Our budget isn't one of the top ones in the division so that's something we have to come to terms with, but I'd like to think with John's expertise, as we've done over the past season we've bought players in and those players have improved with us. "It's not always about buying the finished article, it's bringing younger players in who can come on in leaps and bounds and contribute a lot to the team and the success of the Club. It's not hard to work out the 60%, what we've got to do is fit the players into that wage budget. There are certain positions that both myself and John feel are more important than others. "Right up the spine of the team are is the most important thing, the goalkeeper, centre halves, midfield players and strikers they are top priority so that's perhaps where a bit more money goes into." "One player I wanted to sign was Rob Purdie, but he told me on Thursday he was going to join another club. I’m a little bit disappointed in that because I thought we had a good chance of Rob coming back, and I had a specific job in mind for Rob had he come here, but that’s gone now so we’ll move onto somebody else." He also confirmed interest in loanee Jennison Myrie-Williams: "I'm very interested in Jennison, I've spoken to him and he's told me that he's waiting to see what develops which is fair enough, and I've asked him to keep me informed." Trewick also speaks about some of the released players, saying that Dean Beckwith "probably needed a change", Jack McLeod was "a decent right back, right side midfield, but Sam Gwynne can do the same job and I felt it would be duplicating positions", and Michael D'Agostino struggled with injuries: "we didn’t have enough to go on to offer him a new contract." The interview, in text form, is currently available on the official site, with the full video due to be uploaded later. Hereford United chairman Graham Turner has spoken to BBC Hereford and Worcester about pre-season friendlies. "I think we probably need another home pre-season match and then we will look for several away games. "When Wolves came down last season you had got to fancy them for promotion. "When you looked at their side through the game with us, it was the pace they played at. "When you looked at how Southampton played when they came up here there was no comparison, so it didn't surprise me that Wolves were promoted and Southampton relegated. "It also gives us an opportunity to have a look at some of the young lads from these bigger clubs. "In the past we have had one or two players from Wolves so when we play them it will give us an opportunity to keep the good relationship going. "It is nice to have the relationships that we have with Wolves and West Brom, while it would be nice to get closer links with Aston Villa and to get some of their young lads out but we have not been able to do that so far." The Bulls have made their first signing of the summer, bringing ex-Wolves man Keith Lowe to the club on a one year deal. Lowe, 6’ 2” and just over 13 stone featured in a pre-season friendly for Harriers against The Bulls before joining the Carpeteers initially on non-contract terms. A victim of the budget cuts at Aggborough the 23 year old right sided full back played in all but four matches of Harriers' Conference campaign after being released by Wolves the previous summer. He spent the previous season on loan at Port Vale in League One and has around 30 games under his belt in the Championship for Wolves and Burnley. John Trewick has confirmed to the Official Website that he is chasing released Bristol Rovers full-back Ryan Green. The former Welsh international played at Edgar Street for three seasons, scoring the winner in the play-off final against Halifax Town. New manager Trewick is sure to be busy in the coming weeks and months, after returning from holiday today. Ex-Bull Rob Purdie has followed former boss Dave Penney from Darlington to Oldham. The versatile 26 year old has signed a two year deal with the Boundary Park club after two years at the Quakers. He played 140 times for the Bulls in a five year spell, covering just about every position on the pitch, before opting to take a 50% pay rise at Darlington. After yesterday's news that Hartlepool were chasing ex-Bull Richard Jackson comes the news that they also want ex-Bull Michael Rose from Stockport. Rose is reported to have failed to trigger a contract renewal clause based on appearances at the financially stricken side. Brighton are also claimed to be in the hunt, along with other League One sides. Crewe have made Histon's industrial central defender Patrick Ada their first signing. The 24 year old signs a two year deal. Alleged Bulls target Craig Holloway is set to join Chelmsford according to the Essex press. The goalkeeper was named last Friday as having spoken to the Bulls and Aldershot about a Football League return. Merthyr Tydfil have been offered a lifeline of a sort. An unnamed businessman wants to buy the club for £300,000 to merge a Welsh league side into them and keep the new side in the English pyramid. Ebbsfleet have settled on a £4,000 a week budget for next season. It is half this season's original budget, and claimed to be the lowest in the Conference. Aldershot fans have launched a special fund to assist manager Gary Waddock with his playing budget after it was dramatically cut for the coming season. The fund has already raised £40,000. Macclesfield have signed full back Stephen Reed from Weymouth and Nottm Forest forward Emile Sinclair, both on one year free transfer deals. Sinclair spent time at Moss Rose on loan, scoring once in 17 games. The Bulls are expected to be mid-table next season as the first bookmaker issues prices for the coming League Two season. Shrewsbury, Bradford, Northampton, Gillingham 8/1. Chesterfield, Rotherham 12/1. Crewe, Bury, Bournemouth 14/1. Rochdale, Dagenham, Cheltenham, Darlington 16/1. Hereford, Lincoln, Aldershot 20/1. Grimsby, Torquay, Port Vale, Notts County, Morecambe 25/1. Barnet, Burton 33/1. Macclesfield, Accrington 50/1. In an interview with the Hereford Times, published today, Ben Smith revealed he missed an automatic contract renewal by just one game. "I have had one concrete offer, with was better than Hereford, from another club. It's a full-time club and it's definitely an option. I've had a few other enquiries. It's still very early and, at the moment, I want to keep my options open." "But if I do leave Hereford I would like to stay in the Midlands or move back to Essex." Graham Turner has commented to the Hereford Times on possible changes to the VP Club at Edgar Street. “There will be no change for members and the objectives of the club will be the same as they were before,” said the Hereford United chairman. “It is just that the organisation of the bar and the door will come under the auspices of the football club,"
“Veronica (Richardson) has done an excellent job and we want to ensure that the good business practices that she has put in place continue. “It is difficult to ask anyone who has paid a fee to be a member to then be involved in all the matchday duties that Veronica was involved in and she seemed to have stopped enjoying her football. Darlington have confirmed Colin Todd as their new manager, and that former owner George Houghton will return to the club after having a bid accepted by the Administrator. They will not exit Administration for at least two months as negotiations with the local council and Football League will need to be resolved before the deal is finalised. Ex-Bull Richard Jackson is being linked to Hartlepool, with their local press saying he wants to be closer to his Scarborough roots. Port Vale are negotiating a settlement with former manager Dean Glover over the remaining year of his contract after he rejected a youth role at the club. John Ward and Mickey Adams are the frontrunners for the job. Chesterfield are expected to choose between Colin Calderwood and John Sheridan for their manager's job. One of Chester's bidders has been revealed as former player David Jones. He has been quoted £1million for the club. Former club managing director Gareth Evans is also interested. The Administrators want a deal concluded before the Conference AGM in three weeks. Notts County have signed Kettering striker Craig Westcarr on a one year deal. He scored eight times for the Conference side last season, and has taken a pay cut to move up a level. Rochdale have signed midfielder Jason Kennedy from Darlington on a two year deal. Released Brentford defender Craig Pead has quit the game on medical advice. The 27 year old, who was named in the divisional XI while at Walsall, managed just eight games last season. Cheltenham have confirmed talks with striker Ryan Lowe. Hereford United have invited VP Club members to an 'informal meeting' to 'alleviate any concerns' following the sudden announcement that the VP Club was to be taken over. A letter, dated 19th May 2009, signed by Graham Turner invites members to the meeting to discuss the situation that has 'led to a number of queries from members'. The letter goes on to state 'A full and frank discussion is envisaged' for the June 1st meeting. The letter also states that an AGM will be held in July, a note that was not included in the original letter received by members on May 15th. Many members had assumed that there would be no AGM as that original letter made no reference to it, and the club had apparently already set membership prices for the coming season - a function usually associated with the AGM. Herefordshire Council have released details of the plans for the new livestock market to be situated just off the Roman Road on the northwest edge of the city. The new market will replace the existing one which is opposite Hereford United's Edgar Street football stadium. The council has 'issued a planning application for a new livestock market' which, in time, should mean that the exisiting 8 acre site in the centre of Hereford can be redeveloped as part of the Edgar Street Grid always assuming the Council pass the plans. As far as is known the old market will be demolished and the space set aside for parking until the new venture starts to take shape. Grimsby have signed striker Barry Conlon on a two year deal. The former Bradford and Mansfield man scored five times in eight games in a loan spell as the Mariners escaped relegation. The Mariners have released midfielders Paul Bolland and James Hunt after contract talks broke down. Notts County have signed Barnet captain Neal Bishop. The midfielder, 27, has spent two years at Barnet and turned down a new deal to move to Meadow Lane. Weymouth have named Team Bath management pair Matty Hale and Andy Tillson as their new management team. Hale was Tillson's assistant at Bath, but the pair have switched roles with Hale a former Terras player. Former Aston Villa striker Stefan Moore is turning out for Birmingham amateur league side Silhill's fourth team to keep fit after his Kidderminster deal ran out. He scored five times in two games. Salisbury are in advanced talks with two serious bidders to take over the club. The England 'C' team lost 1-0 to Belgium at Rushden last night. Chester's local press report three seperate parties are speaking to their Administrator. Ex-Bull Wayne Brown may be on his way out of Bury after Peterboro goalkeeper Mark Tyler confirmed talks with the club where he had a loan spell while Brown was injured. AFC Hornchurch have gone into Administration, less than five years after the original Hornchurch side went bust. They were the side that spent heavily under Garry Hill before both Hill and chairman Gary Calder took many of the squad to Weymouth and almost bankrupted them. Ex-Bulls Dean Smith and Andy Reece were part of a Walsall all-star team that played a charity match at the Bescot Stadium last night. Andy Ferrell has confirmed to the local press that his move to York was down to Kidderminster's budget constraints: "With the financial situation at the club, the gaffer told me that he wouldn't stand in my way if I wanted to move on. They just wanted me off the wage bill. When I was told that, I didn’t want to stay and be a burden, as the gaffer reckoned he could maybe get a couple of players in for what I was earning - so it was best that we went our separate ways." The Hereford United director Graham Turner has said that it is nice to have a few local players in the squad. "We've got a couple of youth-team players (Joel Edwards and Tyler Weir) that have been training with us on a regular basis, played the odd game in the reserves, and I think (manager) John (Trewick) and myself are both in agreement that they've got some potential," Turner told BBC Hereford and Worcester. "If you add to those, Craig Jones and Sam Gwynne, there's four local lads. It's nice to see some local talent coming through and maybe making an impact. "I've said before we'd love to have a squad of local players but it's not going to work out like that, but it's nice to have one or two lads that are from the area. "And before they came into us they were Hereford United supporters so it means something to them to be playing for the club." Former Bull Andy Ferrell has left Kidderminster for York after two years at Aggborough. "Fez has been absolutely fantastic for the football club over the last two years. He's always put his head on the line for the cause and he's been a pleasure to work with; and this move is a great one for him as he can now be closer to home. We wish him success for his future career." Ferrell played 65 times for the Bulls between 2005 and 2007 before angering the management by putting joke signatures on a sponsors match ball. He was farmed out on loan to Kidderminster before being released at the end of the 2007 season. Meanwhile, claimed Bulls transfer target Craig Hinton has told the givemefootball website that he would like a club within commuting distance of Bristol: "I have spoken to a few clubs but nothing concrete as yet. I would hope that I would have something sorted out by pre-season or worse case scenario for the first game of the season. We live in Bristol so it would be nice to find a club within commuting distance but I am realistic enough know that we will probably have to move if I am going to carry on playing." Veteran manager Colin Todd is set to become Darlington's manager and the club will exit Administration before the end of the week, a local paper claims. The Northern Echo reports that the former Bolton, Bradford, and Middlesboro manager has offered Dean Windass the no.2 role with a takeover of the club, believed to involve ex-Chairman George Houghton, due to be completed within days. But the club could face further sanctions after their accountants released the accounts for the 2006/7 season - and showed the club paying 110% of it's turnover on wages. The accounts, to October 31st 2007, show the club to have a balance sheet that was over £5million in the red and spending nearly £300,000 more than it's total earnings on wages. The wage bill worked out at over £55,000 a week during the year in question. The Football League are to investigate the figures, with staff salaries - including all players and office staff - not to exceed 75% of turnover under the same rules that prevent players' wages being more than 60% of turnover. Ex-Bull Tony James is one of seven Burton Albion players to agree new full time deals with the club. James has never played in the League after 370 games over eleven years at Conference level for the Brewers, Bulls, and Weymouth. Rotherham are claimed to be readying a six figure bid for Peterboro striker Liam Hatch. Notts County are to sign Darlington midfielder Ricky Ravenhill on a two year deal. Swindon have priced striker Simon Cox at £2.5million after rejecting two bids claimed to be around £750,000. MK Dons have released six players after their play-off loss. Amongst the six are Tore Andre Flo and winger Jemal Johnson. Brighton have announced they have secured funding for the full £93million cost of their new Falmer stadium. Professional gambler Tony Bloom, a World Poker Tour regular, is to bankroll the majority of the cost and becomes chairman and major shareholder after converting £18million of loans into a 75% shareholding. Rochdale have terminated the contract of striker Lee McEvilly by mutual consent. He was one of three players transfer listed last week. Grimsby have signed defender Joe Widdowson from West Ham on a free transfer after a loan spell at Blundell Park last season. The 20 year old has signed a three year deal. 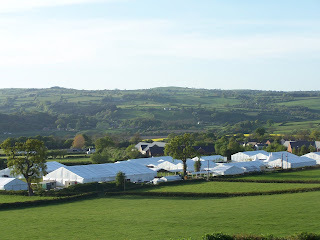 For the fourth year in succession Hereford United supporters will be manning a car park at the world famous Hay Festival which starts this coming Thursday, May 21st. 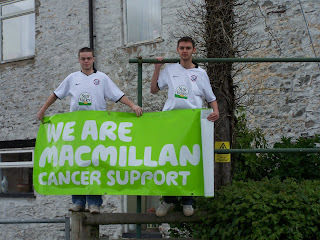 And, again for the fourth year, the Macmillan Renton Appeal for new cancer facilities at Hereford Hospital is the charity the supporters are backing. Over the past three years over £35,000 has been raised for this most deserving cause from the profits of this car park. The Hay Festival is based just outside the small market town of Hay, some 20 miles or so west of Hereford. There is something for everybody at the Festival. The programme of some five hundred events takes place in the tented festival village where writers, politicians, poets, scientists, comedians, philosophers and musicians come together on the greenfield site to talk, eat, think, drink and be merry. As well as well known figures from the literary world those appearing over the eleven days include Desmond Tutu, Tony Curtis, Trudie Styler and Sting, Rick Wakeman, Frank Skinner, Robert Peston, Stephen Fry, Jo Whiley and Dylan Morgan. For those coming to the Festival from Hay/Leominster/Hereford/Ross the Macmillan car park is on the left hand side just after the Festival site. If approaching from Brecon/Builth/Abergavenny the car park is on the right immediately before the Festival. The Macmillan car park will open at mid-day next Thursday and close when the last vehicle leaves. Parking costs £5 per day, or £3 after 6pm, and includes free travel on the Booth's Books Bus which is a regular shuttle service from the Festival into the centre of Hay. Four days parking will cost £15 and a 'season' ticket will cost £30. Meanwhile the Festival has its own real ale this year. Brewed by the Spinning Dog Brewery, Hereford it is called 'May Blossom'. It can be purchased in the Herefordshire Real Ale and Traditional Cider Bar which will also have draught cider from Westons. Finally there is a second festival taking place in Hay over the same eleven days. How The Light Gets In is the UK's first philosophy and music festival in Hay on-Wye and is based at the Globe in the centre of the town. Southampton's Administrator has told the press that a sale of the club is unlikely in the timescale available. Main bidders Pinnacle, supported by Matt Le Tissier, have lost consortium members and their unofficial approach is said by the Administator to not be what they originally claimed to be able to offer. Some fan sites are suggesting the club has only a week left to formulate a deal. Northwich are the latest side to enter Administration, utilising the same firm used by Chester. They owe around £500,000 - most of which was inhereted by current owner Jim Rushe when he bought the club nearly two years ago. Rushe still intends to complete purchase of their stadium by mid-June but the club itself cannot sign new players until outstanding debts are paid. Stockport's Supporters' Trust has lodged a bid for the club. They have assembled a group of local businessmen that will purchase the majority of the club, with the Trust holding 10%. They are one of a number of potential bidders still eyeing up the club. Chester's owner, Stephen Vaughan, appears to be trying to side-step FA rules on insolvency after putting his son down as the owner of the club at Companies House. The twohundredpercent website has a nice update on Vaughan and his dealings that is worth a read, with the FA's 'fit and proper person' rules blacklisting anyone with two insolvent clubs behind them. One potential bidder for the club told the Devachat forum "Needless to say the figure i was quoted was completely out of a viable pricerange given the current circumstances"
Bournemouth still have a winding up order on the table over a failed Twenty20 cricket match last August despite owner Paul Baker saying the matter has been dealt with. Baker has one firm offer on the table for the club, and six other bidders circling. Darlington's hopes of selling teenage striker Curtis Main to Fulham have been dashed. An official club statement says both Newcastle and Middlesboro are still interested in the 16 year old. Press reports say land owner, and former club chairman, George Houghton won't let go of a majority stake in the stadium and surrounding land to any bidder. Despite hopes that Manchester United would bring a team to Edgar Street for a pre-season game, it has been confirmed that it has been impossible to arrange a suitable date. "Manchester United have got a full programme so they weren't able to accomodate us this pre-season," Graham Turner told BBC Hereford and Worcester. "We were hoping to get them coming down but at some time in the future they will bring a side down. There is no doubt about that." Turner said that the club was hopeful that one or two more friendlies will be arranged possibly with premiership clubs in the Midlands. Experts at the New Football Pools have been examining 42 years of club records and have separated five of the best for Hereford United. They looked at all sorts of factors including club honours, involvement in title/relegation races, play-offs, points achieved, home and away records, goals scored, individual matches that make a season particularly memorable and the impact of individual players on a season. If beating Newcastle United in the FA Cup and getting elected into the Football League weren’t enough for the Hereford fans, they then watched their team win promotion in their first season in the Fourth Division. Remaining unbeaten for their final 19 home games was what took them into second place, behind Southport, by the end of the season, but it still took a 1-0 win at Edgar Street against Crewe on the final day to secure that historic promotion. We have to include it, we just have to. Hereford, as a non-league side, beat Newcastle United in the FA Cup third round, and then took West Ham United to a replay. It was that 2-1 win over the Magpies, however, that has gone into Cup folklore. Goals from Ricky George and Ronnie Radford won the game for United, and sparked a joyous pitch invasion that seems to have appeared on TV on every third round day ever since. For the 14,000 who packed into Edgar Street, it was a moment that could never be beaten. After nine years in the Conference, Hereford beat Halifax Town 3-2 after extra time in the play-off final to give their fans cause for wild celebration. The Bulls’ hero was Ryan Green, who curled a ball from just inside the area past Town keeper Jon Kennedy. It was just reward for Graham Turner’s men, who had finished second in the Conference three years in succession, but in both previous seasons had lost in the play-off semi-finals. Four years earlier, Hereford had been a non-league club, but now they were celebrating a place in the Second Division, and the chance to play the likes of Chelsea, Nottingham Forest and Wolves. The Bulls set club records galore during the season – most points, most goals and longest scoring run – and they finished the season as Third Division champions, six points ahead of Cardiff. Hereford won more league games (28 out of 42) than ever before, set a club points record (91) and scored a record 103 goals (61 of them away), but still they had to settle for the runners-up spot in the Conference. Hereford scored nine at Dagenham, seven at Forest Green and seven at home to Halifax, but they scored only one in the play-off semi-final against Aldershot. The two-legged tie was eventually decided by penalties, which the Shot won 4-2. Server problems at the headquarters of the Football League in London put the Hereford United official website off the air today. The 'technical glitch' also affected both Chester City and Boston United who use the same server. Normal service was resumed around 4pm. Graham Turner has told BBC Hereford and Worcester that players must be more realistic in their pay demands this coming season. "There is no doubt that [in the past] we have lost players because we couldn't match what they were looking for and we wouldn't pay agents' fees," said the Hereford United chairman. "But I think there will be a change in the climate now when you talk to agents and players. "They have got to be realistic and I get the impression that they know that. "Obviously the good players will still be in demand and will still command good contracts, but there are an awful lot that could do a good job for us who will come down to our wage levels. "John (Trewick) and I have worked together over a list of players and we have asked some of them if anything is happening yet and it has been a case of, 'no, I haven't had a single phone call yet'." League newcomers Burton Albion have appointed Paul Peschisolido as their new manager. The former Birmingham City striker had been Jeff Kenna's no.2 at Irish side St Pats Athletic, but quit prior to the weekend for 'personal reasons'. Peschisolido is joined by Gary Rowett as his no.2. Rowett ended his playing career at Burton with an 18 month spell. Cambridge have accepted an approach from an unnamed club for manager Gary Brabin just hours after losing the Conference play-off final. They will be cutting their budget significantly after failing to win promotion, but hope Brabin will stay. Shrewsbury have sold 18,000 tickets for their play-off final on Saturday. Gillingham have sold 30,000. Grimsby have released defender Chris Llewellyn halfway through his two year deal by mutual consent. The former Wrexham man has joined Welsh Premier side Neath. Darlington striker Pawel Abbot is wanted by Hearts and former club Huddersfield. Bury have released three players following their play-off semi final defeat. Striker Glynn Hurst heads the list after 27 goals in 127 games for the club. Tranmere have offered former Bulls loanee Stephen Jennings a new contract, one of six to be offered new deals, but has released four others. Watford have not received any firm bids for ex-Bull Theo Robinson. Swindon were claimed to have bid for the 20 year old with Simon Cox expected to depart the County Ground. Macclesfield have signed beanpole forward Ben Wright on a one year deal following his release from Lincoln. Another Hereford United player has chosen to speak to the press about whether he might have to leave Hereford United. Last Wednesday it was Steve Guinan, this morning it's Ben Smith. "I spoke to John Trewick at the end of the season and he said if I was going to stay for another season I was looking a a hefty pay cut. He left it with me and we will speak in the next few weeks," Smith told the Worcester News. "I have spoken to a few other clubs and had offers put on the table but I still haven’t taken any of them. "I have enjoyed my time at Hereford, I am really settled but with the figures they are talking about it doesn’t seem that I will be playing for them next season." 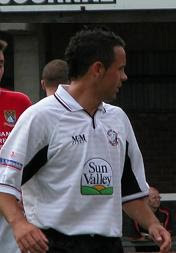 Midfielder Smith was given a two and a half year contract when he signed for the Bulls in January 2007. Manager Graham Turner was reported to have paid £20,000 to Weymouth for Smith. Here is a complete list of the winners of the Hereford United VP Club draw which is held monthly throughout the season. Torquay are back in the Football League after defeating ten man Cambridge United 2-0 in the Conference play-off at Wembley this afternoon. And it was two former Bulls players, Chris Hargreaves and Tim Sills, that scored the Torquay goals. The return of Torquay to League Two will be welcomed by many Hereford United supporters as it will mean an away trip to Devon next season. Histon chairman Gareth Baldwin has told the Daily Mail of death threats and the fire-bombing of a club official's car after they drew a match in September. Within 30 seconds of Lewes taking a surprise lead against a Histon side which was a short-priced favourite to win the game, the first of 38 threatening phone calls to seven club officials was made. The caller warned of dire consequences if Histon did not win and claimed to know where officials worked and lived, and even where their children went to school. A last-minute equaliser earned Histon a draw but at just before 1am the following morning, a car belonging to club president Peter Betson was set on fire outside a college at Cambridge University, where he works as a night porter. About an hour later a female official received a call warning her to leave her house because it was about to be firebombed. Further threats were received in the days following the game, including a warning that unless Histon paid £100,000 — the amount the caller claimed his group had lost — the team coach would be ambushed while travelling to or from a forthcoming game at Wrexham and everyone on board shot. Cambridgeshire Police subsequently handed over the investigation to Merseyside Police, who were unable to confirm reports that a man had been charged in connection with the allegations. The paper notes five matches that are being investigated by the FA, including the Weymouth-Rushden match and Forest Green-Grays game. Chester have entered Administration, it has been confirmed this morning. They will start next season with at least a ten point penalty, but it could be significantly worse. Depending on how they exit Administation they may face further penalties and - as with Bournemouth and Rotherham last season - they could face heavier punishment as it is their second Administration period after an earlier spell in 1998. Update - A statement on Chester's official site says the move into Adminstration was done last Thursday. Martin Shaw, of Refresh Recovery Ltd, issued a statement saying: "Supporters can be assured that our aim is to find a new owner for the club so that professional football continues to be played in Chester from the start of the new season. "In order to achieve this we need to find a new buyer able to invest heavily in to the club and then to obtain approval from the clubs creditors to the sale. We are already talking to potential purchasers of financial substance and as time is short I would urge any other parties seriously interested in buying the business to make contact with us sooner rather than later." Ex-Bull Chris Weale is a target for Leicester. Yeovil had hoped to re-sign the 27 year old, who is now out of contract at Bristol City, after he helped them stay in League One. Bournemouth are under a partial transfer embargo, and can sign no more than 20 players until certain monies are paid off. The club has one firm offer for it on the table and are still negotiating with other parties. Millwall have been handed 49,500 tickets for their League One play-off final with Scunthorpe. The Irons have received less than 20,000. Yeovil have released goalkeeper coach Len Bond in addition to ex-Bulls physio Wayne Jones and the club masseur. The club say they want to move 'in a different direction'. Rotherham will sign Sheff Utd keeper Jamie Annerson on the expiry of his Bramall Lane contract. The 20 year old was an emergency loan keeper for the club last season, but never made an appearance. Darlington's only serious bidder, Raj Singh, says the chances of him making a new bid for the club are 50/50 after one of his three man group pulled out, with the other of the trio also having second thoughts. Kidderminster chairman Barry Norgrove says the club's playing budget is the same as this time last season, despite them cutting eight players and dithering on contracts for five more. Ex-Bull Scott Tynan has left Northwich after his contract expired. He is one of a number of players that has not been paid for up to six weeks. Ex-Bull Ian Foster has been told there is no money in the pot to strengthen his Galway side after opening gates for the Irish league season were 500 down on last season - nearly a 40% drop. They are mid-table after 12 games. With strong rumours that former Hereford United defender Ryan Green has spoken to John Trewick about a possible return to Edgar Street, we look back to the time when he originally joined the club. It was on 31st July 2003 that it was confirmed that Ryan Green had signed for Hereford United. The news broke after a friendly against Birmingham City at Edgar Street in which Green played. Ryan Green has signed a two year contract with the Bulls. A couple of days later the same site published an article about Green joining the Bulls. Green was signed as a replacement for Matt Clarke, who switched to Telford United in May 2003. His first league game was at Tamworth on August 9th. The Bulls won 3-1 and went straight to the top of the Conference. Scunthorpe will play Millwall at Wembley in the League One play-off final after defeating MK Dons on penalties this evening. There was no score after extra-time. Former Hereford United striker Gary Hooper missed the game as he was injured. In an interview with the PFA, Steve Guinan has emphasised his desire to stay with The Bulls. The former Cheltenham striker commented, "My ideal scenario would be to stay at Hereford. The club offered me a contract, which would involve me taking a pay cut and talks have reached a stalemate. "It is a case of keeping my options open at present and seeing who else is out there but I have no desire to leave Hereford at present." Meanwhile, Sky Sports has an article claiming that John Trewick has tabled offers for Bristol Rovers trio' Craig Hinton, Ryan Green and Craig Disley. All three are out of contract and the Western Daily Press claimed United were interested in them a couple of days ago. Finally, a former Hereford United player captained Liverpool yesterday evening. Paul Harrison, who featured just oncefor United in the 2006/2007 season on the opening day at Stockport County when he replaced the injured Wayne Brown, played for the Anfield based club in a Legends v All Stars team. The game marked 20 years since Hillsborough and featured a host of former stars such as Peter Beardsley, Ian Rush, Alan Hansen and Alan Shearer. Harrison had family killed in the tragedy and was given the opportunity to play in front of the Kop. The End of The VP Club? Members of the HUFC Vice Presidents Club have today received an undated letter signed by Graham Turner and Joan Fennessy telling them that their Club is being taken over by The Football Club. The letter cites the recent resignation of VP Chairman, Veronica Richardson, and the apparent historical difficulty in getting members to join the committee as reason for the takeover. Veronica Richardson is, of course, the lady who fairly recently took ownership of largish block of HUFC shares. "In view of that situation, the Board of Directors have taken the decision to bring the organisation of The Vice President’s Club under the auspices of the Football Club." There is some question over the legality of this action as the VP Club is of course subject to the member's constitution which says that the Club will be run by an elected administrative committee. In short, The VP Club is owned by its members and any major change in its operation would normally come about only following an AGM or EGM. The Football Club, as "Landlords" of the premises in which the VP Club is located will have say over the property but is it entitled to simply "take over" a members club? The other issue that might not have been considered is the licensing of the premises for the consumption of alcohol. The present license will be in the name of the committee or, more likely, one of its members. Any change of ownership would probably require a new license without which no alcohol could be sold on the premises. As far as Bulls News is aware, there has been no prior notification to members regarding this action, no AGM and no EGM. It is likely that many members will see this as another wedge being driven between the fans and The Club. The letter closes by inviting members to renew membership for the coming season. At this stage, it's not clear how the Football Club can collect membership fees for a Club whose ownership transfer has not been subject to rules contained in its own constitution. They are all coming to Hereford! At least three players have been linked with Hereford United this morning. Braintree goalkeeper Craig Holloway is reported to be attracting clubs in both the Blue Square Premier and Football League including Hereford United. "I think Craig is an excellent goalkeeper and undoubtedly capable of playing again at a higher level and I expect him to leave and find a suitable club," said the Braintree manager. "I know there have been approaches to him and good luck to him if he gets a chance to move up." Meanwhile the York Press suggests that 'previous KitKat Crescent target Justin Richards and fellow striker Matt Barnes-Homer are believed to be heading for League Two side Hereford'. It's all speculation at this time so no supporters should read too much into these reports. However Hereford United are looking for a dozen or so players so maybe, just maybe, one of the above players might get at least a trial at Edgar Street. Finally the Daily Star says that 'Bristol Rovers Ryan Green is on the verge of signing for Hereford United'. The club have confirmed the departures of Jose Veiga and Michael D'Agostino after the official site updated their released list. Portugese goalkeeper Veiga signed non-contract terms in December after a sucession of injuries to bodies and pride of goalkeepers limited the club's options. He made only one senior appearance, a 4-2 loss at Hartlepool. D'Agostino signed a short term deal in February but, despite a handful of appearances on the matchday squad list, never crossed the white line and saw opportunities on the wing reduced with the loan signings of Marc Pugh and Jennison Myrie-Williams. The Bulls now have only eight of last season's squad under contract or continuing negotiations, with two former youth teamers also agreeing deals to turn professional. With the management at the club expecting twenty players to be signed on there will be at least ten new faces to arrive during the summer months. Former Bulls trialist James McPike, who featured in the HFA defeat at Westfields, is reported to have signed for Kettering. Ex-Bull Dean Martin, a largely forgettable signing during the 98/99 season, has been interviewed for the Les Rosbifs site that follows English footballers abroad. He made one appearance at Edgar Street before resuming his career in Iceland, remembering his Bulls stint saying "I knew Hereford was not right for me from the start. I did not get that feeling." Yorkshire Police reported 13 arrests after last night's Leeds-Millwall match. Horses were used outside the ground to force, what the local paper reports as, thousands of Leeds fans away from Millwall fans boarding buses. Port Vale have received an application from departed Brighton boss Mickey Adams for their managerial post. The bookies rate Steve Bould and Temuri Ketsbaia as the favourites, but neither has applied according to the club. Accrington have transfer listed top earner Paul Mullin as they cannot afford to keep him. The 35 year old was previously a target of the Bulls and spent the latter part of the season at Bradford for financial reasons. Stockport are to miss out on a transfer fee for keeper Owain Fon Williams as the youngster, according to Sky Sports, has not been paid for a sufficient length of time for him to walk away from the club. Lincoln have confirmed the sale of midfielder Lee Frecklington to Peterboro for an undisclosed fee. He spent the latter part of the season at The Posh after 141 games for the Imps.